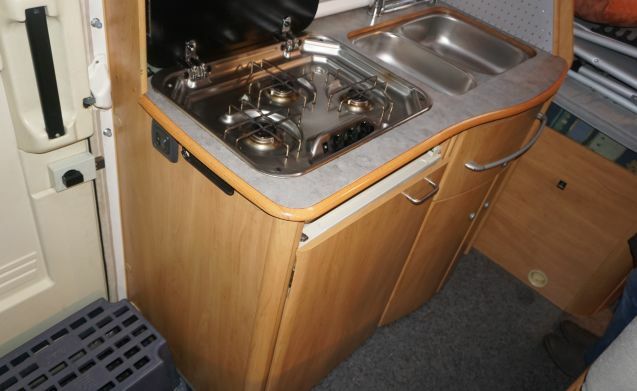 This Hymer semi-integral camper is easy to drive and has cruise control and navigation. 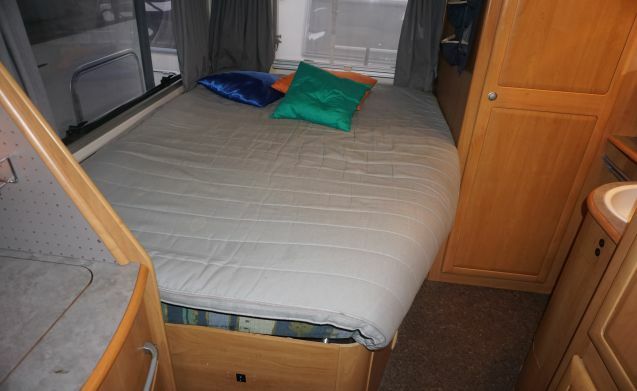 The interior is bright and clean and the fixed (French) bed has a good firm mattress. 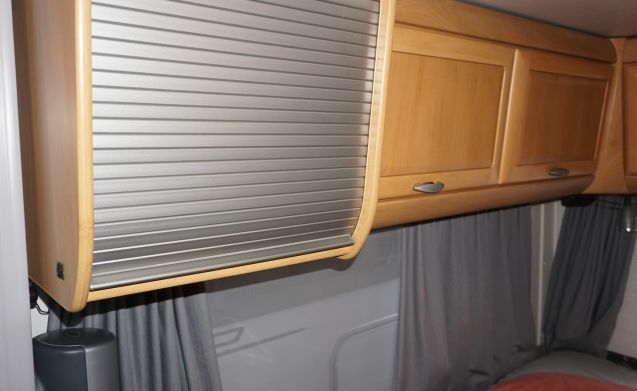 The spacious storage under the bed, which can be reached from inside and outside and the many cabinets in the camper provide plenty of storage space. 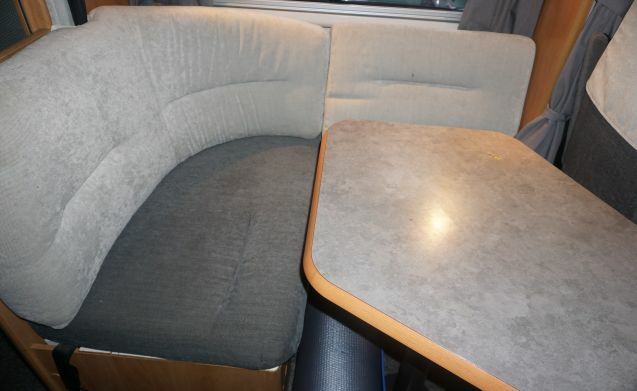 The camper is 6.00 m long excluding bike rack, 2.70 m high without a dish and 2.30 m wide and because the 2 swivel front seats can be involved in the living area is the living space very generous. 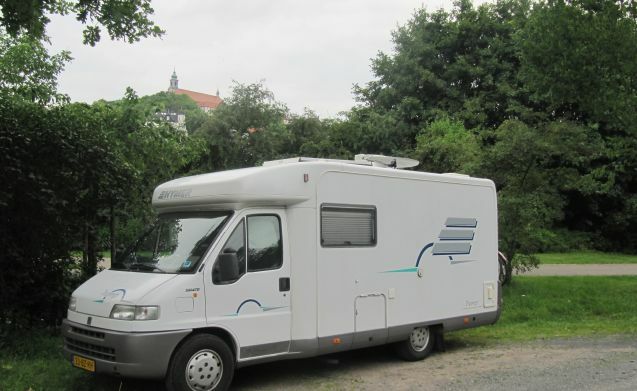 In short, a reliable and comfortable camper for a nice holiday. The camper is equipped with a number of extras. 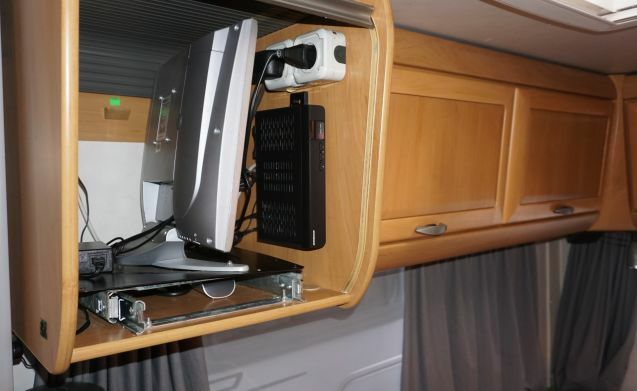 A TV and dish with a subscription, a safe, a new reversing camera and a new radio with USB connection and CD player. There are also two extra lounge chairs and a cadac barbecue. 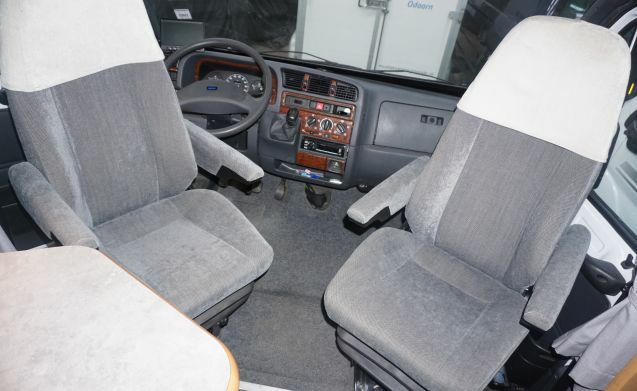 For safety the camper is equipped with gas, carbon monoxide and fire detector and there is also a fire extinguisher present. There is also a safety bracket mounted. There is also a gas (BBQ) connection on the outside. 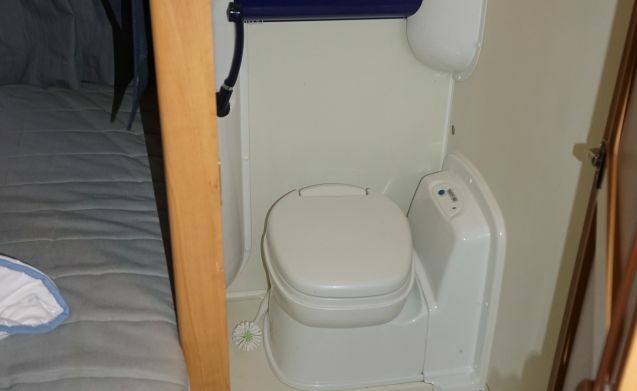 The chemical toilet is equipped with an extraction system that removes unwanted odors. There is 1 solar panel that feeds the battery. 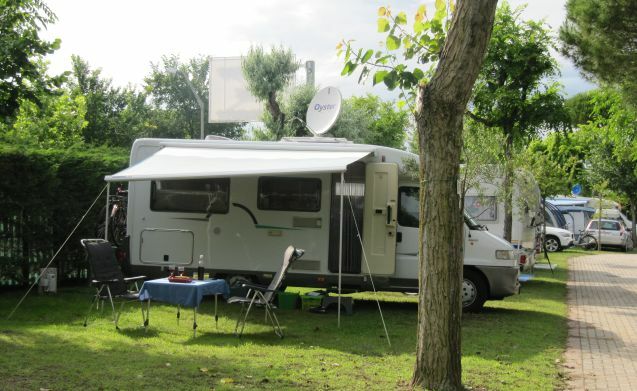 You can also camp on motorhome pitches without an electricity connection. Most of the lights are LED lamps. The bike carrier is also suitable for electric bikes. 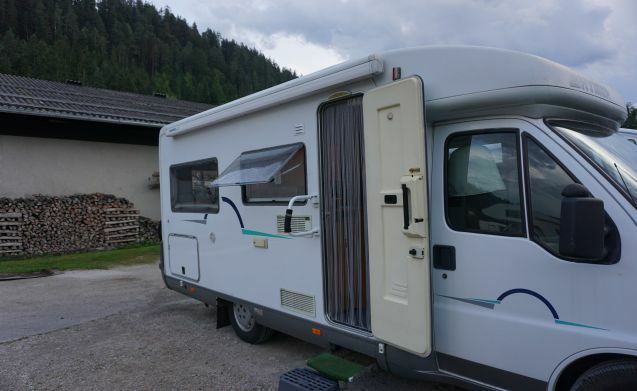 In consultation, transfer to or from public transport can be arranged in connection with pick-up or drop-off of the camper. Pets allowed if fragrance and hairfree returned, cost odor and hairfree make € 300. 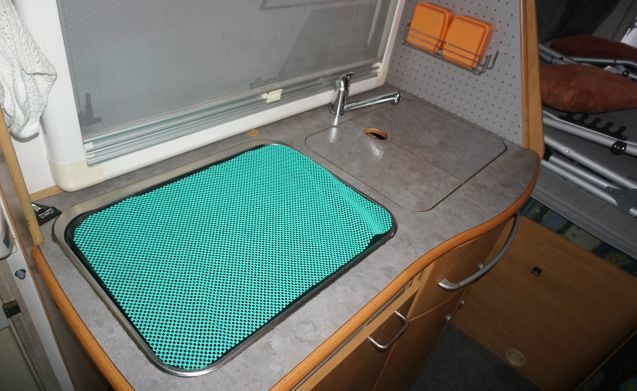 The camper must be handed in properly cleaned. Duvet package and linen package washed, empty toilet cassette and return clean, otherwise € 250 will be charged. Breaking the breach or loss of things yourself. Response from Frits Dit waren de laatste loodjes dit seizoen voor de camper.We zullen alles goed na laten kijken voor het volgende jaar. Jullie hebben de camper weer superschool ingeleverd. Response from Frits We hebben de camper ook weer prima teruggekregen. Response from Frits Harry en Mariette, fijn dat jullie genoten hebben van de vakantie en van onze camper. Tot nu toe treffen we het wel met onze huurders. Response from Frits Het is altijd fijn als je prettige en tevreden huurders hebt en dat waren jullie . Response from Frits Jullie waren ook prettige huurders.Wij kregen de camper tip top weer terug, dus misschien tot volgend jaar. Response from Frits Gerda, wij vinden het fijn dat de camper goed bevallen is.